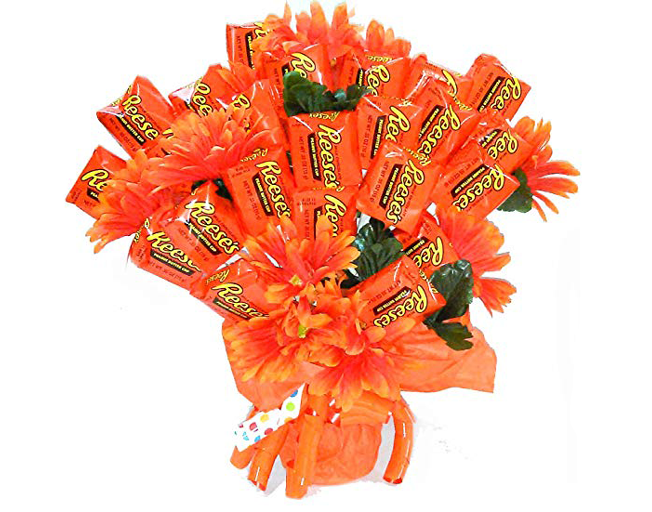 How about a Reese’s Bouquet for Valentine’s Day? If you don’t want to give your sweetheart flowers on Valentine’s Day this year the Reese’s Bouquet is an excellent alternative! The holiday that half of us look forward to and the other half could do without is less than a month away. This could be a way to avoid the stress of what to get that special someone in your life. The “Reese’s Extravaganza Bouquet” includes 36 peanut butter cups mixed with orange faux flowers to create this sweet bouquet. The Reese’s Bouquet can be purchased at Walmart and Overstock.com. Which would you prefer to get on Valentine’s Day, a dozen roses or the Reese’s Bouquet? Personally, I would go for the candy over flowers!